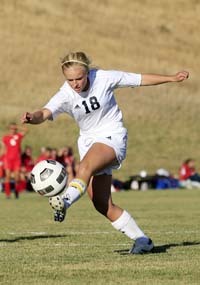 The Sun Valley independent school has never put a team into the championship game of the State 3A girls’ soccer tournament, but the Cutthroats and supporters hope that changes this weekend at SunWay Soccer Complex in Twin Falls. Coach Kelly Feldman’s Cutthroats (14-2-1) carry a 13-game unbeaten streak and a deep roster of talented players into the eight-school State 3A tournament that begins Thursday, Oct. 18 with four games. The Cutthroats have outscored opponents 94-16 and boast 10 shutouts in 17 games. The Cutthroats, making their 12th consecutive trip to state soccer, square off against Fruitland Thursday at 2 p.m. Fruitland, the 2008 state champion, did not compete at state last year but booked its 2012 tickets with a 6-1 victory over Bonners Ferry in Saturday’s state play-in game at Lewiston. No. 1-ranked reigning state champion McCall-Donnelly (14-1-1) defeated Fruitland 7-1 for the 3rd District title last week and had a 3-0-1 advantage over the Grizzlies this season. Like the No. 2-ranked Community School, McCall has been dominant this season with a 91-7 goals-against and seven shutouts in the last eight games. McCall-Donnelly (17-4-1 in 2011) edged the Cutthroats 1-0 in last year’s state semi-final at Caldwell en route to its fourth state girls’ soccer title 2-1 over Weiser. The Vandals also won in 2006 and 2001-02. The Cutthroats were last year’s third-place winners 8-3 over Teton. Marsh Valley of Arimo won the consolation title 2-1 in double overtime over Timberlake’s White Tigers from Spirit Lake. Early in the current season, host McCall-Donnelly won 4-2 and 4-1 over the visiting Cutthroats, who haven’t lost since. ( Thursday, Oct. 18: at 11 a.m., Shelley (10-2-7) vs. Bliss (11-3-2) and McCall-Donnelly (14-1-1) vs. American Falls; and at 2 p.m., Timberlake (10-4-2) vs. Marsh Valley and the Community School (14-2-1) vs. Fruitland. If the Cutthroats win Thursday, they’ll play the winner of Timberlake-Marsh Valley Friday at 2 p.m.
Championship game of the Idaho High School Activities Association tournament is Saturday, Oct. 20 at 2 p.m.